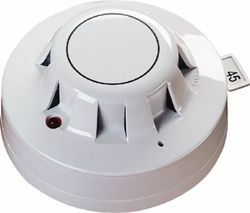 The Apollo 55000-600APO is an analogue addressable optical smoke detector from the XP95 range of fire alarm system detectors. This detector is sometimes known as the Apollo 55000-600. This detector is designed for use on Apollo XP95 protocol fire alarm systems. This detector uses the Apollo Xpert card addressing system which means the detector is addressed by a card in the base. This feature means that it is extremely easy to install a replacement detector as the detector itself does not have to be adjusted for address numbering. To compliment the Apollo 55000-600APO XP95 Optical Smoke Detector there is a full range of heat and multisensors. This detector is also suitable for installation with the XP95 addressable range of base sounders and combined base sounder beacons. These devices allow a single point on a ceiling to provide detection for smoke in the room and then also provide a warning signal to the buildings occupants once the fire alarm system has been activated. This removes the need to install seperate wall mounted sounders additional to the detector. This can save installation costs and time. If you’re interested in the Apollo 55000-600APO you may also be interested in our Apollo XP95 Detectors and Apollo XP95 Call Point ranges.